who told us that the area was located on Asnebumskit Hill in Paxton. He told us that the exact latitude, longitude was Paxton: 42.18.80 N 71.54.32W. We also heard from Ken Lubin who had this additional information and directions: To find this area, go down Rte #31 from Paxton Center and take a right at Bel Air Rd or Ave. Go to the end and there is an old parking lot where the hill then goes up. Co to the top of the hill and there is an engine and rope tow towers. There are a couple trails. It is a very famous place in Worcester for mountain biking. Here's an overhead view of the area...not much left. Kevin Beach used to ski here: The ski area in Paxton, MA (Kopola's, actually spelled Kauppila) was never open to the public. The father built it for his children and their friends. I lived on Asnebumskit Hill and skied there a number of times while in grammar school. The trails facing west were very steep (but short) but the west exposure melted the snow quickly. Because the family business was welding, the rope tow towers were steel, rather than the usual old telephone poles, and they did have some basic home built, but clever, grooming equipment. I never skied there again after going to high school and I believe it was not used much if at all after 1975. Kopola's was not the only ski area on Asnebumskit Hill. During my grammar school days (1964-1968) another ski area existed on the other side of the hill. 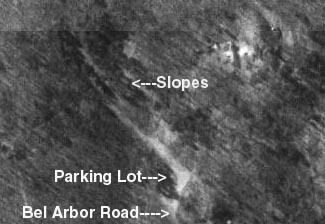 This area was the brainchild of Stan Miller from Paxton who, with help from all our fathers, cut 2 ski trails from the top of the hill down to a corner of the neighborhood near its base. 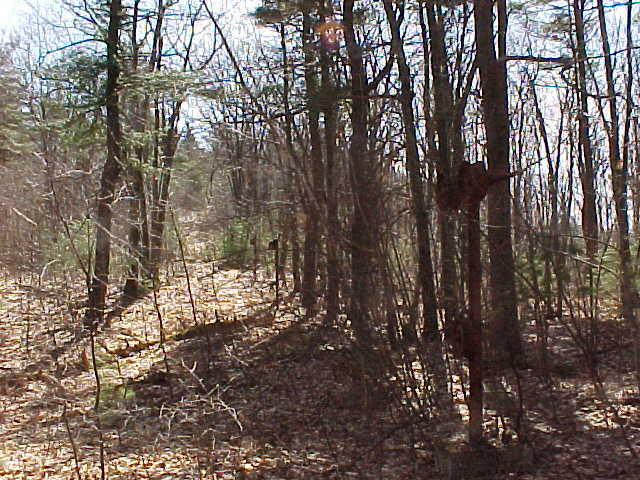 There was a road to the top of the hill to service the radio and TV stations located there at the time providing car access to the top of these 2 trails. Stan made a special ski rack which hung off the sides of his station wagon and we would stuff our skis in them and he would drive us to the top. We would put our skis on and fly down the hill, where Stan would meet us and lug us back to the top. Often our first trip up would be side stepping the entire length to pack the new snow (oh, yeah, we kids just LOVED that part), but the runs back down were terrific. The trails were classic New England, narrow and wooded all the way. As we entered high school, we all were skiing every weekend at local ski areas (Pine Ridge for must of us) and we no longer skied on these wonderful trails. They still were a great place to sled for years until I moved away to college. This is public land and the last time I was up there it was still possible to see the trails. Kevin Thomas and Steve Bongiorno also told us of this area. After reading about this area Laurie P. decided to take a visit and check it out. Here is what she had to say: I spoke to a neighbor of the area and he said that the area had 1 Rope tow, 3 slopes/trails, but he really didn't know much else about it, as it had closed prior to his moving into his house. He told me that people go in there all of the time and it is a favorite place for mountain bikers and four-wheelers and warned me that three four-wheelers had just gone into the area. 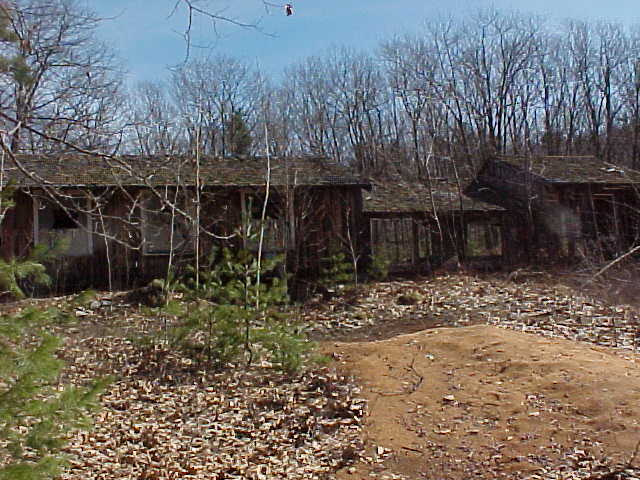 As I explored the area I made the following observations: a building that appears to have been the lodge, some old related and unrelated machinery, rope tow towers with wheels intact, the motor house at the top, some pieces of wood that looked as if they may have once been signs, no evidence of lights, no evidence of snow making. The area is at the end of Bel Arbor Lane which is about 3 to 4 miles away from Anna Maria College on route 31 as you head toward Holden MA. Currently, four-wheelers use the area, there were three there when I stopped. 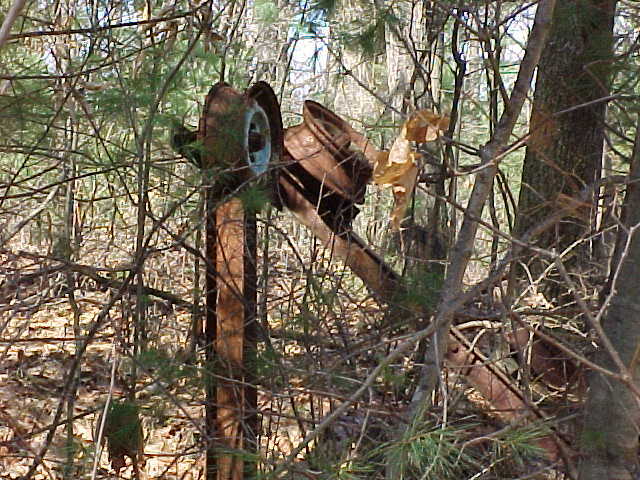 As I entered the little dirt road that seemed to go into the area I saw several piles of rusted metal and other rubble, some of which may have been from the ski area. 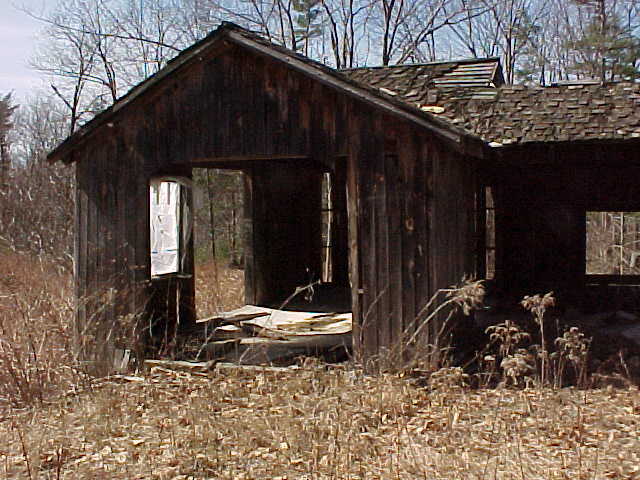 Not too far in the road, I came across an old abandoned building to the right of the ski lift. The road was actually driveable, but I chose to walk in not knowing what I would find as I got deeper into the area. One wall was completely missing on the building and the interior was completely gutted. In front of the building there were two newer vehicles each with a trailer for carrying four-wheelers, but no signs of the four-wheelers. Behind the building there were several old abandoned cars and trucks, which did not seem related to the ski area. Below that there was a maintenance shed with several gas cans, motors and car and truck parts piled up. It was nearly impossible to get to the shed to look inside. Inside the shed there were more motors and parts, nothing that looked as if it were part of the ski area. This may have been another business run by the people who ran the ski area. After snooping around there for a while, I decided to explore the rope tow and the hill. All of the pulley wheels and rope towers were still standing on the hill. 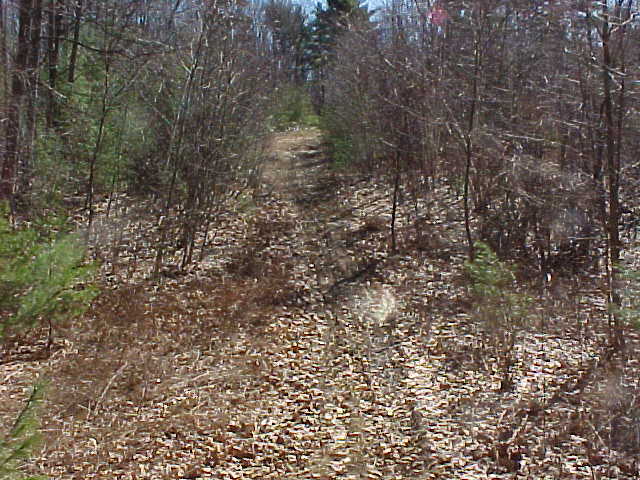 Some of the trails were still relatively clear due to the four-wheeler and mountain bike traffic in the past few years. I decided to walk up the trail to the left of the rope as you looked up the hill. The hill started of fairly gradual, but became steeper as I ascended. As I walked I could see from the new growth and brush in the area that it was actually quite a bit wider than the current paths. Just before what appeared to be a split in the trail, I noticed old pieces of wood, they may have been signs, the other side was painted, but I could not make out what they said. 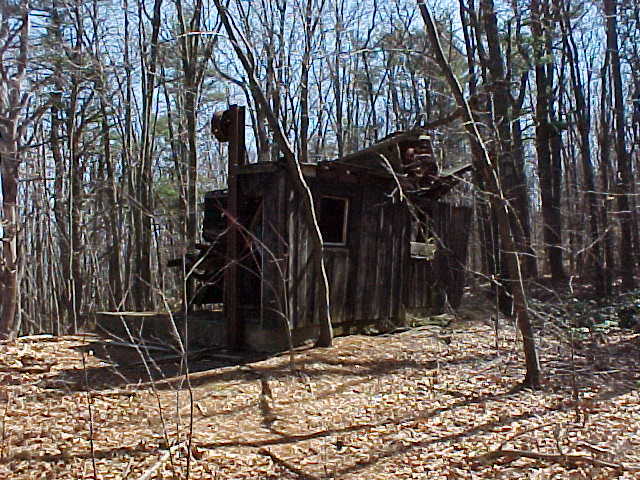 When I got to the top, I found the top shack still intact. The motor was still in it's place. Looking at the top wheel, it appears as if the up hill rope went into the building in the front then came around to the back and up and over this wheel to head back down the hill. I decided to take a different trail back down the hill. This was a steeper slope. It seemed to be a narrow, windy trail and looked as though it might have had a tree here and there to ski around as you went down. For this area, it was probably their black diamond trail. At one point this hill was so steep and had so many loose rocks that I had trouble keeping my footing and had to cross over to the center trail with the rope tow on it. Laurie's Photo Album, with pictures taken in March of 2002. Click on each picture for the larger version. 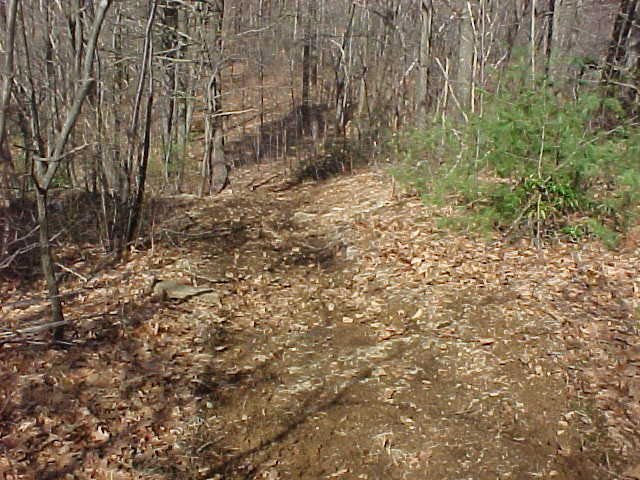 A path leading up the hill (to the left of the tow rope as you face up hill. The building next to the ski slopes. I believe this was probably the lodge. The interior of that same building from another angle. The same building from the back. The bottom of the rope tow. First wheel after the base of the rope tow. Notice how low it is to the ground. Several of the rope towers going up the hill. Looking up at a split in the trail. Notice the pieces of wood that may have been signs. 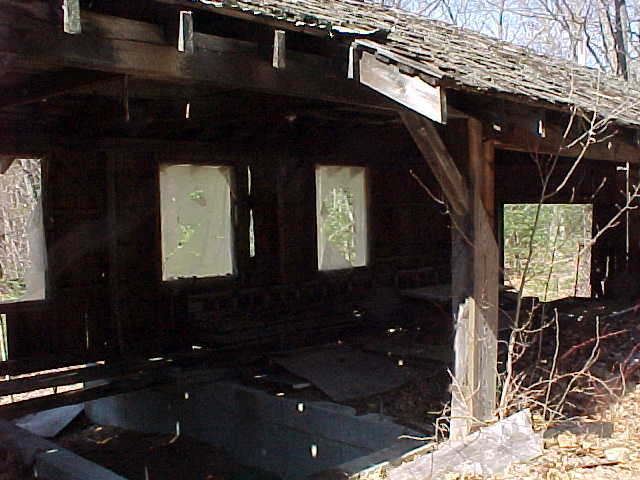 The rope tow shack at the top of the hill. 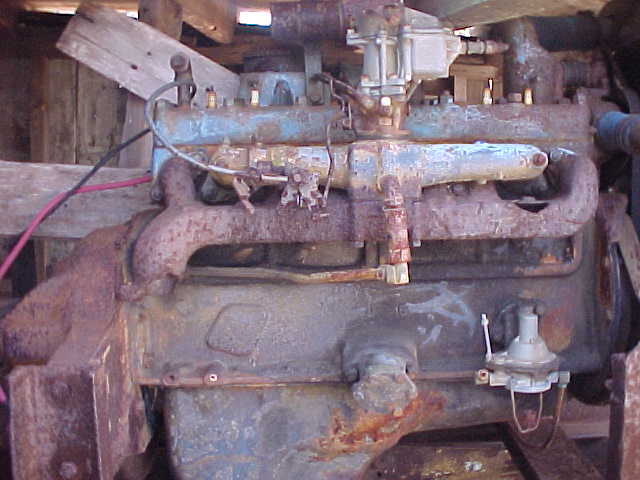 The motor for the rope tow. 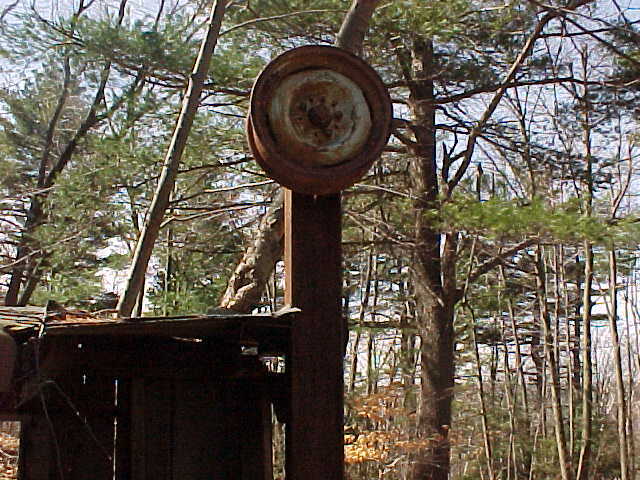 The top wheel on the motor house. 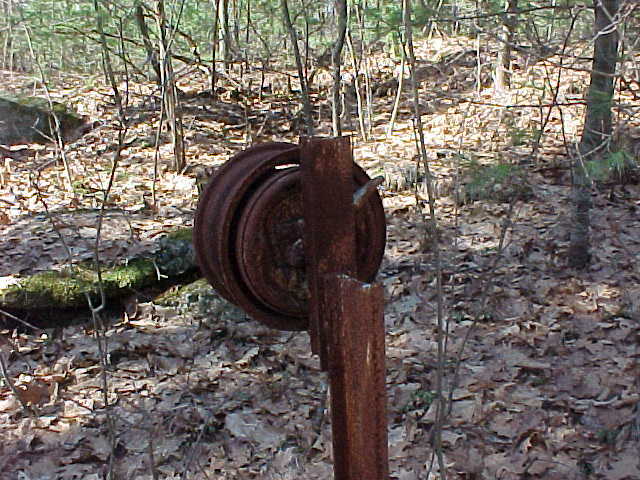 There was a fence piece attached to a pipe with cotter pins at each end that looked as though they may have been part of some early grooming (drag) device. I had taken pictures of it but unfortunately, I lost that disk somehow. 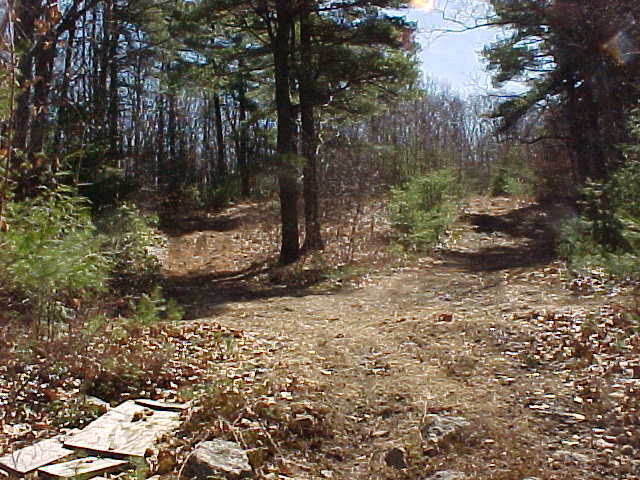 In the pictures, the area does not look very steep, the two side trails were quite steep in some places. I would say that the rope had to have been 1000' long at least.